Tornadoes in our area are not unheard of, but they’re rare. I recall a handful of them occuring within a few miles of us over the past several years. Saturday had been a rainy day, but our weather took a quick turn for the worse around mid-afternoon. I had been watching radar and saw the yellows and reds, indicating heavy rain was heading our way from the west. Motor Man was working at our shop just a few miles away, so I called to warn him about the severe weather. He came home a short time later. By then, I had turned the tv on to the Weather Channel, and saw tornado warnings for our area. It’s unsettling to hear the names of your county and little town mentioned in that respect on national tv. One thing made this storm different for us: shortly after Motor Man came home, we actually heard the rumbling “train” sound associated with a tornado. Later, when we discovered where the storms hit, we realized that one was only about two (air) miles from us. And when everything calmed down, we took a ride out to see what damage the storms had done. 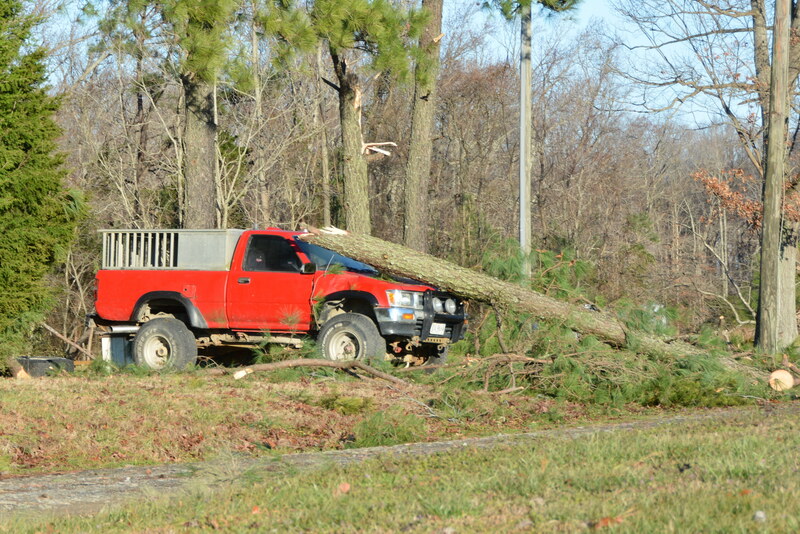 Most of what we saw was downed trees, but there was also some property damage, including this truck, some knocked down privacy fences, and some trimwork ripped from houses. 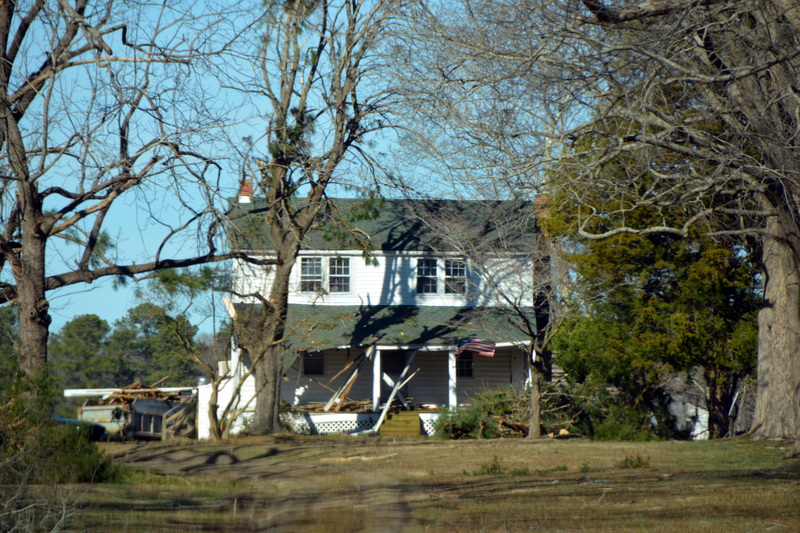 The weather service determined that two EF-0 tornadoes touched down in our county. We didn’t want to drive too far down the driveway of this old home. But obviously, it suffered some damage. I’m not sure if anyone lives here. Thankfully, these were fairly small tornadoes, and there were no injuries or fatalities. But I can’t imagine how scary it must have been for those in the paths of these storms. And I really don’t care to ever hear that “train” again. This entry was posted in Days at Home, Traveling Days and tagged tornadoes. Bookmark the permalink. It was definitely a scary afternoon. I’m so glad we don’t often have weather like that. We fortunately haven’t tornados in our area, I agree it must be horrible to be in the path of a tornado. So scary! I did not realize the tornadoes came so close to you. Glad you and JR are okay. Glad you are ok! Tornadoes are truly scary. Thank heavens the warning system has improved but it is still tough to know where one will pop up. so glad it was not worse! The ‘train’ sound of a tornado is one you don’t soon forget. I’ll never forget the tornado I experienced over 35 years ago and the sights and sounds of it. Good to hear that storm missed you and didn’t do any major damage in your area. Hurricanes AND tornadoes. Too much weather being thrown our way! We were exempt from hurricanes this year. I guess it’s Mother Natures way of keeping us on our toes! I was in Kitty Hawk and we also had the warnings. I didn’t hear a train noise but our house on stilts felt like it moved a foot! I wondered how close that was to you when I saw the location the next day. Wind can do a lot of damage in a hurry. We had straight-line winds once, Linn was in Michigan at the time. When I looked outside, after hearing something strike the house, I couldn’t see the school across the street! Definitely creepy! So glad it left you alone. Oh Wow! That would have seen me heading for the basement! Indeed….it’s a sound I never want to hear again either…..David and I still talk about the day one came through Warrenton and hopped right over our house and continued its’ path of destruction through the community never touching us…..I’m glad you guys were safe too! Seems we have bad storms at almost any time of the year these days, whereas they used to only come in the spring. We have a good cellar to go in, if we keep up with the storm track! I’m so glad you and Motorman and the kitties are o.k. I have never experienced a tornado. They have to be totally frightening, especially when you can hear them coming. I agree what a scary Saturday. I’m thankful you all are okay. Look at those big lovely trees snapped off in your photos. It’s a shame about the property damage, but a blessing no one was seriously injured.